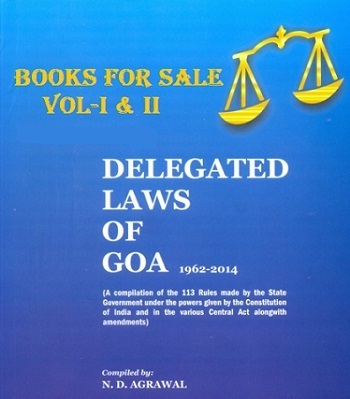 Search Engine with greatest of Comprehensive Compilation of Goa State Acts, Rules and lot more !! Amendments in the Acts/ Rules/ Notifications are continuous process. Goakaido is pleased to offer to the members of the legal fraternity as well as general public online updates of the Laws of the Land. Read more..
Ex-Collector and District Magistrate of South Goa. During my tenure in the government service at various positions, I along with other government officials faced difficulties from the non-availability of updated Acts / Rules /Laws etc. The legal practitioner and also a common man face similar issues. I do recall that Public Interest Litigation was filed in the Honorable High Court of Bombay at Panaji seeking direction to the Government to publish updated Acts/Rules/Laws etc. All applications pertaining to Property Registration/Document Registration shall be processed online only:- All applications pertaining to Property Registration/Document Registration shall be processed online only without requiring the applicant to physically submit a copy of the application .The applicants may also choose to make online payment of Stamp Duty and Registration Fee and may thereafter avail the facility of generation of appointment date and time through the system. *Further, it is also mandated that all queries against applicants’ applications (if any) should be submitted to the applicants only once and within 7 days of receipt of the application. *This Notification shall come into force with effect from the 1st day of January, 2019. Seasonal Pass Scheme for Daily Commuters and Students by K.T.C. notified : The Government has notified new Seasonal Pass Scheme for Daily Commuters and Students by K.T.C.-2019.In which student and other who are presently eligible for 50% concession will get 80% concession on monthly pass. http://www.narayanipublications.com/content_page/90-rules-under-central-acts-cover/433-motor-vehicles-act-1988. Age limit of the Chairperson of SC/ST commission extended to 67 years. 1. The Agricultural Department Notified 10 more service under time bound Delivery of Public Service Act, Town Planning Department reduce time period to issue NOC under Section 49(6) of TCP Act for execution of Sale deed from 20 days to 15 days and Fisheries Department enhance the time for disposal of the application for Registration Certificate for fishing canoe from 15 days to 60 days. The Government vide two Notifications issued on 5-10-2018 Notified 10 more services of Agricultural Department under Time Bound Delivery of Public Service Act, 2013 , Department of Town and Country Planning reduce the period to issue N.O.C. under Section 49(6) of TCP Act for execution of Sale deed from 20 days to 15 days, but under Department of Fisheries Vessel Registration Certificate for fishing canoe period has increased from 15 days to 60 days. As per earlier Notification dated 21-12-2015 field officer to submit its report within 5 days by present notification its increased to 35 days. Similarly the decision on the application which earlier to be taken in 5 days as per present Notification he has given 20 days’ time.. It may be noted that as per Time bound delivery of Public Service Act, 2013 each Head of the Department( Director ) has to dispose the file in not more than four days. Additional Collectors Notified as Collector under Abolition of Proprietorship, Titles and Grants of Land Act, 2014: Additional Collectors (I and II) of both the District Notified as Collector for the purpose of Abolition of Proprietorship, Titles and Grants of Land Act, 2014. Mopa Airport Development Authority Notified: The Government vide Notification dated 5-10-2018 notified 12 member Mopa Airport Development Authority headed by the Chief Minister. District Level Zoonosis Committee” Constituted : Government constituted 7 member District Level Zoonosis committee under the Chairman of District Magistrate for monitor and control Zoonosis disease. The Government amended the Salaries and Allowances of Minister Act 1964 and Salary ,Allowances and Pension of MLA Act 2004 and made provisions that now Salary and allowances will be regulate as per the Central 6th Pay Commission recommendations time to time. Dy. Collector replaced by the Dy. Director Transport as Chairman of R.T.A. Appellate Authority for Advance Ruling under G.S.T. Constituted. The Government has appointed Susima Mandrekar is new Chairperson of Goa State Commission for Protection of Child Rights in place of Dr. (Mrs.) Sushma P. Kirtani. Also Fr. Maverick Fernandes Instituto Nossa Senhora De Piedade in place of Dr. Ameeta Mascarenhas. The benefit of remits the stamp duty which was earlier restricted to the gift when it relates to immovable property in favour of educational institution/ charitable organisation, which is registered as a society with the Inspector General of Societies, Government of Goa, under the Societies Registration Act, 1860 (Act 21 of 1860), at least fifteen years before the date of coming into force of the Government Order No.35/2/2013-RD dated 01-04-2015, now extended to the sale deed also. 1. Government form Committee Chaired by Ex- Collector N.D.Agrawal to inquire into Audit finding regarding Performance Audit on Management of Alvara Lands. The Government has appointed 6 members committee to inquire in to the Audit Finding regarding Performance Audit on Management of Alvara Lands and given 3 month time to submit the report. 2. Jurisdiction of Primary Health Centres re-allotted : After establishing of new Primary Health Centre Chimbel, the Government has re-allotted the village between Primary Health Centre Chimbel, Corlim, Betki and Urban Health Centre Panaji. The Government has fixed 7 days time schedule to the Investment promotion Board to take decision on the applications received from competent authority. The Government has Notified various fees for service provided by the Finger Print Bureau. Government has Notified Additional Commissioner and Dy. Commissioner North and South as appellate authority under Section 4(2) of the GST Act 2017. The Government has extended the Goa State Fuel Subsidy to Private Stage Carriage Operators Scheme, 2014 till December 2018. This scheme initially was there only for three years, which was extended till 31-3-2018. Now vide Notification dated 10-5-2018 this scheme is extended till 31-12-2018. (Notification uploaded on www.goakaido.com). Under this scheme the owners of private buses/minibuses operating on intra-State routes as “stage carriage” as well as those intending to enter the trade for the first time, provides fuel subsidy of Rs. 3/- (Rupees three) per kilometer of operational distance. The Government has provided 6 months time to Alvara land Holder to submit their title documents to obtain title under Land Revenue Code as Occupant Class-I. It may be remember that Decree 3602 was repealed in 1968 and since then Alvara Land Holders were struggling to get Ownership rights. 2. 2. Government rescinds the Notification in which power to hear the appeals under the Land Revenue Code was with Secretary (Revenue). The Government has notified 9 State Specific Disasters which are not included in the NDRF List. 4. Flood like water logging in low lying interior areas. 5. Boat capsize due to heavy rains and gusty winds. 6. Death due to drowning in flooded waters. 9. Landslides in Mining areas. The Government has constituted 21 members State Advisor Board on Disability under Section 66 of the Right of Persons with Disabilities Act, 2016 on 13-4-2018. The Commissioner of Food Safety by order dated 3-4-2018 (published on 19-4-2018) empowered Designated Officers to compound the Offence u/s 69 of the Food Safety and Standards Act, 2006 of small traders. The Government vide order dated 3-4-2018 nominated Shri Akbhar Mulla and Smt. Sneha Bhandare as Civic Society representative in the Committee constituted under sub-rule (4) of Rule-3 under the Goa Town and Country Planning (Public projects/schemes/development work by the Government)Rules 2008 for pursue the proposal, though not in conformity with Regional Plan. The Government has notified following fees for obtaining NOC from TCP for Sale deed of part of survey number under Section 49(6) of the Act. The Scheme to support the Private Bus owners for insurance premium, which was introduced in the year 2014 for 3 year period now extended till March 2020. The Goa Land Revenue (Inspection, Search and supply of Copies of Land Records) (Amendment) Rules, 2018. Prohibition on generation of E-way Bill in respect of intra-State movement of any goods. 65 State Government Schemes linked with Aadhaar Card. Secretary Revenue Appointed as Project Affected Persons Disputes Redressal Authority: The Government vide Notification No. 22/21/2017-RD(Part-I)/545 dated 19-3-2018 published in the Official Gazette Series-II No.52 dated 29-3-2018 appointed Secretary (Revenue) as Project Affected Persons Disputes Redressal Authority under the provisions of the Goa Compensation to the Project Affected Persons and vesting of and in the Government Act 2017. New Goa State Mental Health Authority: The Government vide Notification No. 9/01/2018-III/PHD/699 dated 13-3-2018 re-constituted Goa State Mental Health Authority. Jurisdiction of Porvorim Police Station Notified: The Government vide Notification issued on 15-3-2018 notified following area under the jurisdiction of Porvorim Police Station: 1. Alto Betim. 2. Ramnagar. ,3. Patrakar Colony,4. Pundalik Nagar, 5. Housing Board Colony 6. Police Quarters 7. Customs Colony, 8. Torda Betim 9. Alto Porvorim, 10. Ambirna Soccur,11. Porvorim Bazar. 12. Aradi Soccur. 13. Salvador do Mundo. 14. Paithan. 15. Britona. 16. Penha de France. 17. Pomburpa. 18. Ekoshi. 19. Betim (OP). 20. Verem. 21. Reis Magos. 22. Nerul. 23. Pilerne. 24. Malim. 25. Vaddem Soccur. 26. Karem Soccur. 27. Virlosa. 28. Socorro. Fees under Public Gambling Act hike: The Government vide Notification dated 27-3-2018 hike various fees w.e.f. 1-4-2018. GST Rules Amended: Government vide Notification dated 21-3-2018 and 28-3-2018 amended GST Rules 2nd and third time in 2018. All the amendments are up loaded on the Goa Kaido. GST Notifications: Procedure for updating mobile number and e-mail id of Primary Authorized Signatory and for adding New Authorized Signatory by a Taxpayer under GST.